Whether you’re the company CEO or the summer intern, knowing how to say you’re sorry—and have people actually believe you—is an important business skill. If your subordinate is caught embezzling, or you’re the head of a company in the midst of a massive public safety scandal, simply saying “I’m sorry” probably isn’t going to cut it. Their results suggest that if you’ve really messed up, you’ll do best if you use as many of these six components as possible in your apology; although some of these components were much more important than others. “Our findings showed that the most important component is an acknowledgement of responsibility. Say it is your fault, that you made a mistake,” Lewicki said in a press release. In the first online study, 333 adult participants read a scenario in which they were the manager of an accounting department hiring a new employee. At a previous job, this applicant had filed an incorrect tax return that understated a client’s income. When confronted about the issue, the job candidate apologized for their mistake (i.e. “I was wrong in what I did, and I accepted responsibility for my actions”). In different conditions, participants read an apology containing either one, three, or all six of the different apology components. 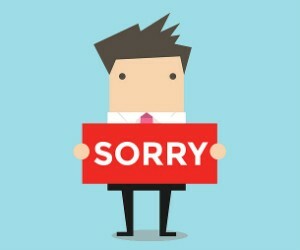 The effectiveness of an apology also depends on the circumstances of the mistake — specifically, whether it was truly an accident or whether rules were purposely broken. Half the participants read that the tax return error occurred because the job applicant misunderstood the relevant tax codes (a competency-based “oops” violation). The other half read a scenario where the candidate knowingly filed the tax return incorrectly, a violation of integrity. After reading the scenario, participants were asked to assess the job applicant’s apology using a 5-point scale for effectiveness, credibility, and adequacy. As predicted, some elements of an apology were far more effective than others. Asking for forgiveness (i.e. “I asked both my manager and client to forgive my mistake”) was the least convincing form of apology, while acknowledging responsibility was by far the most effective. “[I]f someone can make only one statement in an apology, an Acknowledgement of Responsibility may serve the individual significantly better compared to all other components,” the researchers explain. In a second study, 422 college students read the same set of scenarios as in the first study. This time the apologies were written to better mimic an actual spoken statement. Again, participants were asked to rate how effective, credible, and adequate the apology statement was. Across both studies, the best apologies were also the most thorough: The more elements included in the apology, the higher it was rated. And, as expected, apologizing over a lack of personal integrity was less effective than apologizing for a simple mistake. Lewicki and colleagues note that there are limitations to these findings. For example, this study relied on written apologies, but tone of voice and body language could have a huge impact on the perception of a spoken apology. A 2011 Psychological Science study led by David De Cremer (Erasmus University) found that people often overestimate the extent that an apology will make them feel better. Across a series of experiments, people displayed greater trusting behavior when they imagined receiving an apology compared to when they actually received one. “An apology seems to be only the first step of the reconciliation process, because people do not react as positively toward an apology as they think they will,” De Cremer and colleagues explain. If you find yourself in the position of offering a sincere apology, these three appear to be the most important: acknowledging personal responsibility, an explanation for why the violation occurred, and an offer of repair, which may restore the tangible or economic damage that occurred as a result of the violation. This is a very interesting report. I’m interested to know what kind of research has been done on the dynamic between, for instance, a customer and a business when the customer submits a complaint potentially expecting an apology and the business is not at fault for the issue. While the customer might feel validated by the apology from the business, the business could lose credibility with the customer for apologizing and admitting fault when there is nothing they did wrong. Did the research of Lewicki, et. al., include insight into this or is there other research that covers this issue?